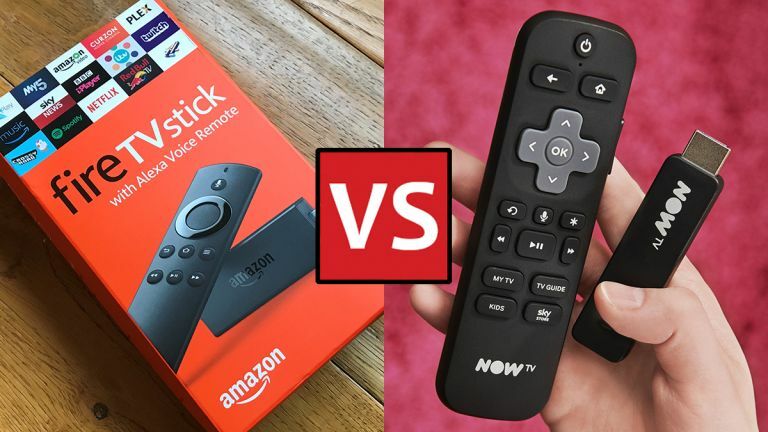 You can buy all manner of smart dongles and boxes, ready to plug into your big screen TV, and bring a world of movie, TV, and music content to your living room (or wherever your TV is) – and here we're going to be taking a closer look at two of the best streaming sticks. Namely, the Now TV Smart Stick and the Amazon Fire TV Stick, both diminutive pieces of plastic that fit into an empty HDMI port on your television and come complete with a remote control. Which one should you be spending your money on? Let's find out. There's not much to choose between the designs of these two streaming sticks, which are roughly the same size with a protruding HDMI plug. The remotes look very similar too, both black slabs of plastic, though we reckon the Now TV one looks just a little bit nicer. If you're wondering why the Now TV Smart Stick (above) looks a lot like a Roku stick, that's because it basically is just a rebadged Roku with Sky services front and centre. We love Rokus though, so that's definitely a positive for the Now TV device. The Amazon Fire TV Stick can display content up to Full HD or 1080p, so the picture will be decent enough even if it's not quite the latest 4K resolutions offered by the likes of the latest Apple TV, the Nvidia Shield, and the new Amazon Fire TV. Meanwhile the Now TV Smart Stick can only show 720p streams for the time being, with 1080p promised by the end of the year. Let's hope that it's sooner rather than later – 720p is just about acceptable, but television screens are only getting bigger. Meanwhile, both these sticks include a mains adapter to get them powered up. The remotes play a big part in the functionality of both these streaming dongles, with simple to use buttons letting you navigate around your video and music feeds, and the on-board menus, with relative ease. Both remotes also feature voice search, which is going to save you a whole lot of typing when you're trying to find a particular movie to watch, or a television series, or films featuring a certain actor. Amazon's implementation has the edge here, because you can also use your voice to control playback. Even better, the Fire TV Stick comes with Amazon's Alexa digital assistant on board, so you can access the same tens of thousands of Alexa skills you get on an Amazon Echo: control your smart home, get the weather forecast, order a pizza, and so on. Sky and Now TV doesn't have anything to compete here for the time being. On top of that both the Amazon Fire TV Stick and the Now TV Smart Stick can control the power and the volume levels on your television, to save you fiddling about with multiple remotes – the majority of sets on the market today will be compatible, though you'll only get the basics covered. It's here that you're perhaps going to notice the biggest differences in the two sticks if you're flicking between them on two HDMI ports. Amazon favours the Amazon Prime services, like Amazon Video and Amazon Music, while Now TV puts Sky channel packages front and centre. So, if you want to see The Grand Tour, the Amazon stick is a good bet; if you prefer Game of Thrones, then the Now TV device might be a better option. You can't get Amazon services on the Now TV stick and vice versa, though Netflix was recently added. Freeview catch up apps are available on both. The Now TV Smart Stick is the perfect portal to Sky's channels, and you've got four passses or packages to choose from: Entertainment (£7.99/month), covering box sets and Sky Atlantic, Sky Cinema (£9.99/month), Sky Sports (£33.99/month), and Kids (£2.99/month). That might sound like a lot, but it's cheaper than a satellite subscription. If the Now TV Smart Stick has the better premium channels, the Amazon Fire TV Stick has a broader selection of channels and apps. You get Amazon Video and Netflix, as we've already mentioned, plus Spotify and a bunch of other Android games and apps. There's another area where the Now TV Smart Stick really stands out – price. You can pick one up for just £14.99, though the Sky packages cost extra on top of that, so the entry price is really just for Freeview and a few other apps. The Amazon Fire TV Stick, meanwhile, is currently retailing for £39.99 direct from Amazon, with a Prime account (needed for much of the best audio and video content) costing £7.99/month or £79/year. That Prime account comes with a bunch of other bonuses too of course, like speedy deliveries for Amazon orders. At a penny under £15, the Now TV Smart Stick is really a no-brainer if you want to add some simple catch up TV app smarts to an old television. The Sky packages can soon add up though, so the Amazon Fire TV Stick might be better value overall depending on what you want to watch. And really that's what it all comes down to – these are very similar devices from a hardware perspective, and even with caveats like Alexa to consider, it's really the content that's going to sway your choice. For Sky channels, sports, and movies, get the Now TV stick; for Amazon Video and a better choice of other non-Sky apps, go with the Fire TV stick.